Over the road driver is the is spending most of his time on the road, away from home, covering hundreds of miles every day. That’s just one fact that makes this job among the toughest in trucking industry. Other things include irregular eating and sleeping (often in their trucks) and catching up to 11 hours of driving on the road. However, OTR driver is also the one who gets to see so many parts of the country, enjoys the great entertainment on the truck stops, meets other drivers and many interesting people. Personally, I think there are lot of prejudice and misconceptions about truckers, and especially OTR truck drivers. That’s why in this article, I tried to gather all the useful information you will want to know if you’re considering becoming an OTR truck driver. You will also find daily routine from actual driver, some stuff from trucking companies related to this theme and more. Hopefully, you’ll have a clearer picture what it means to be OTR truck driver. As much as unpredictable life on the road is, you will eventually find some sort of daily routine including checking a route for the day, weather conditions and traffic alerts. Over the time you will probably have your favourite truck stops or some other places that are convenient for you . Finally, after having your haul completed, you will discover how much time you want to spend at home. All these things are parts of OTR drivers life, and no matter how much you enjoy the adventure that lies in the fact that every day is different in this job, having a piece of mind is something we all need from time to time. The day usually starts at a truck stop or some rest area. After inspecting his truck and updating logbook, he is having a quick meal before he hit the road. Daily schedule is three or four deliveries or pick-ups, with driving of 600 miles. Days are 14 hours or longer, and he is usually 2-3 days from home, but there are occasions when that time is 10 days. If you want to read full story click here. One particular thing that can make driver’s life easier or harder, is choosing between Live loads and Drop and Hook. Let’s remind what these two methods are, and what are the differences. Live load means getting trailer to the place, and then wait for loading or unloading. The process includes free loading time, usually one or two hours. Everything over that is done for a fee, but you could get stuck for hours. Drop and Hooks are usually significantly faster than Live loads. Drop and Hook is mostly cost twice as much as Live load. 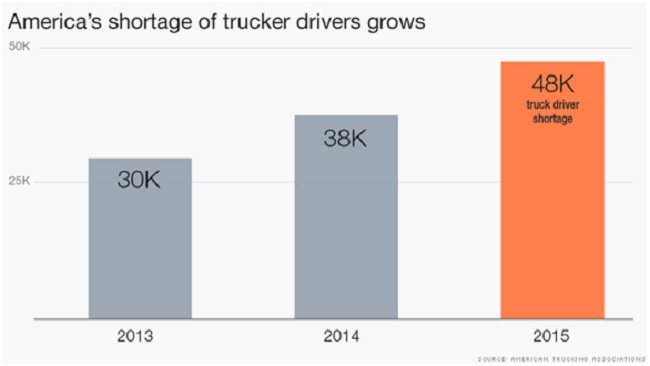 The demand for truck drivers, especially OTR drivers, is higher than ever and the curve won’t get down any time soon. Daily deliveries are already suffering and there is reasonable doubt that US economy will be struck by drivers shortage. Businesses in US need their goods to be transported, and majority transport can done only by trucks. Therefore, they are willing to pay up. So, one of the driver shortage consequences are higher salaries for the drivers. 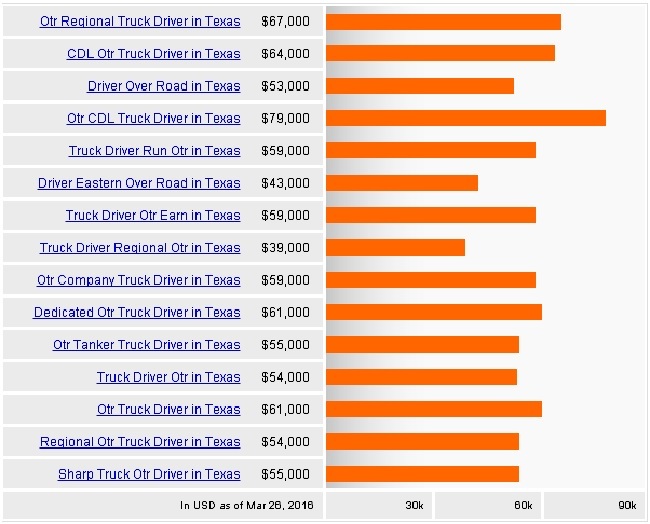 How Much Does Long Distance Truck Drivers Make? Truckers wages are increasing up to 12% in recent years, which is faster than most of other jobs in US. Previously mentioned Mr. Hettinga, said he makes around $75,000 a year, and claims that working for the right company can make you 100k a year. I’ve noticed that potential drivers often want to know how much does a Walmart truck driver make? Walmart claim their driver earn averagely $82,000 in a first year, and according to ATA, $73,000 is a truckers median annual wage in a private fleets including Walmart. If you take a look back just a few year behind, you will notice that in 2012, top 10% of truck drivers have been earning $58,000 per year, and even then it was considered a good pay job. The rise is obvious and trends are advocating it will continue. Add to all this the fact that the most of the trucking companies are paying bonuses for long trips and you will come to conclusion that OTR driver is a good pay and much needed job with great perspective. Over the road truck drivers make inter state deliveries, driving consistent or variety of routes. The distances OTR truck drivers are covering are usually long and often regional routes. Being a long haul truck driver means planning routes, organizing time and calculating rests. Furthermore, you must be familiar with the laws and rules related to carrying cargo on the routes. Transporting freight from starting to delivery point, is of course the main responsibility of truck drivers. To stay compliant with federal regulations, OTR truck drivers have to maintain a logbook of the driving activities. Other responsibilities include inspecting vehicles to ensure safety features, shipping rewiew, securing the loads and more. Most of the time ORT drivers are on the road. That’s why they have to manage things like high irregular sleep, blood pressure, dieting and stress.